Anadral 100 Benefits What is Anadral 100 Used For? Main Goal: Weight Gain - Anadral is an effective agent for promoting weight gain, increasing appetite, and gaining strength. A favorite bulking compound used by elite power lifters, it is highly effective in promoting extensive gains in body mass by greatly improving protein synthesis. 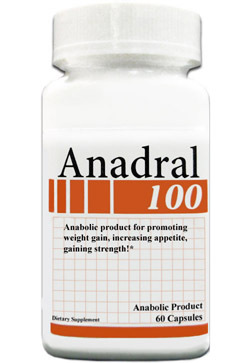 When used to “jumpstart” bulking cycles, Anadral causes a rapid yet equal buildup of strength and weight. Due to its high water retention properties, use Anadral to protect/lube joints while lifting heavy weights. Pack pounds in as little as 2 weeks! Offers a high quality, “hard” look. Use for a period of not less than four (4) weeks. Will solidify post cycle gains when stacked with Dekka or Dian-Bol. 60 Pills per bottle to be taken 1 in the AM and 1 in the PM. Stacks well with Dek-ka. Main Ingredient: 2-Trimethylammonioacetate 25mg, )2r)-2-amino-3-sulfanyl-propanoic acid 10mg, (S)-2-amino-3-methyl-butanoic acid 10mg, plus proprietary blend. Anadral 100 exerts its anabolic effects through non-androgen receptor-mediated mechanisms as it has low affinity with androgen receptors. Because it exerts high anabolic activity but moderate androgenic activity, Anadral 100 is capable of delivering extreme mass gains. Most of the mass gains, however, are due to water retention. So if you are after mass gains you must opt for Anadral 100. And if you do heavy lifting, Anadral 100 is also a great choice due to its ability to retain water. Water retention acts as lubricant to joints and tendons, minimizing the occurrence of fractures and other injury. Hi Brett. Yes, we are in fact HGH.com and our products are completely "legit". If you're looking to get "huge", I would suggest using ANA-GH, our brand new formula will defintely promote muscle gain, and increase your strength and add bulking. It's a brand new formula that adds a lot of new ingredients. i've ben using this product with dekka for about 10 days now. i've gained close to 8lbs! one of my friends asked me if i've actually lost weight. i've gotten compliments on how big my arms are. i noticed to a definite increase in my strength. this stuff works! Hi Jay, You can work out the same way you normally do. If you have any specific questions or want a supplement to best fit your workout program, please email us at support@hgh.com and we will answer your question! i take this product with dekka too. no side affects / better than anything i used to buy at gnc. This is a great strong weight gainer. I'm a trainer at a gym in Chicago and use this and recommend it to people. What is Anadral 100 Used For?